Creamy Coleslaw with Almond + Raisins - Easy Coleslaw Recipe! This is a sponsored post written by me on behalf of Litehouse, however all opinions and statements are my own. Homemade coleslaw is easy to prepare, requires no cooking and can be made ahead of time. With a few simple mix-ins, you’ll have the best coleslaw recipe on the block! 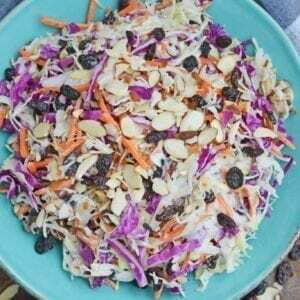 Creamy Coleslaw with almonds and raisins is an easy coleslaw recipe that is mix and serve. 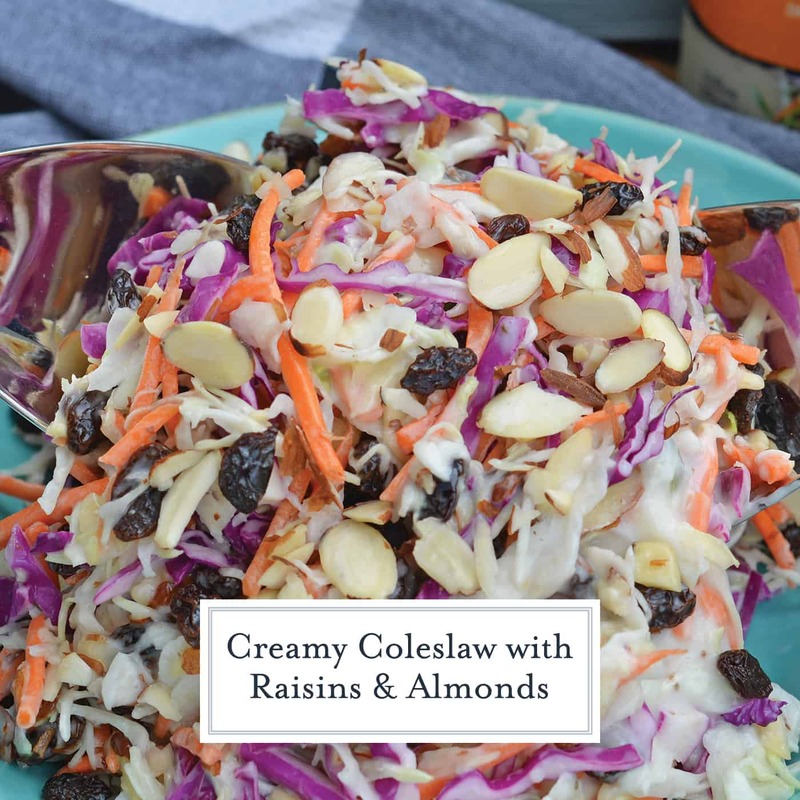 Coleslaw dressing, almonds, raisins and crisp cabbage mix are the perfect BBQ dish. Coleslaw is an iconic summer dish. A picnic table staple, a good creamy coleslaw goes far beyond the best hot weather side dish. Add it to a burger or chicken sandwich. Top BBQ pulled pork or even add it to nachos after you’ve melted the cheese. Leftover coleslaw can even be mixed into a leafy green salad. 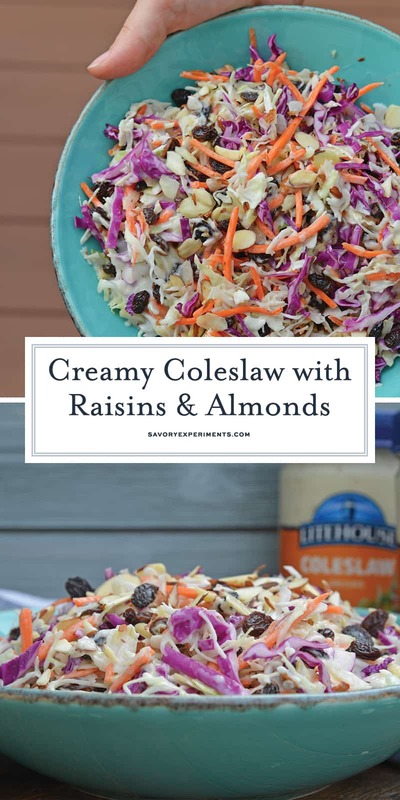 This Creamy Coleslaw with raisins and almonds can be made southern style (finely chopped cabbage), angel hair (thinly sliced cabbage) or regular (shredded julienne style). ONE. Save time by purchasing a packaged coleslaw mix. 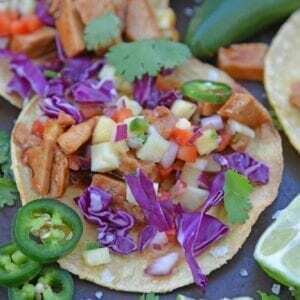 Some are shredded cabbage only, others are a blend of green and red cabbage with shredded carrots. Inspect the bag well for any browning before purchasing and of course, check the bagged date. TWO. Coleslaw dressing is crucial, and saving time is key. 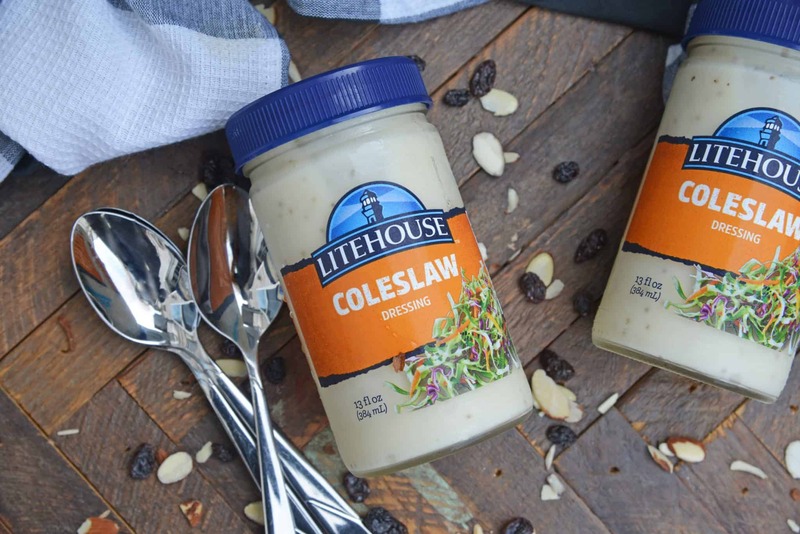 Litehouse Coleslaw Dressing is made with freshly-made mayonnaise, resulting in a thick and creamy dressing that won’t get watery after mixing. It is also sold cold, so your homemade coleslaw won’t require chilling time, making it truly mix and serve. Sweet and tangy, you just can’t go wrong! THREE. Mix-ins are what make this the best coleslaw recipe. 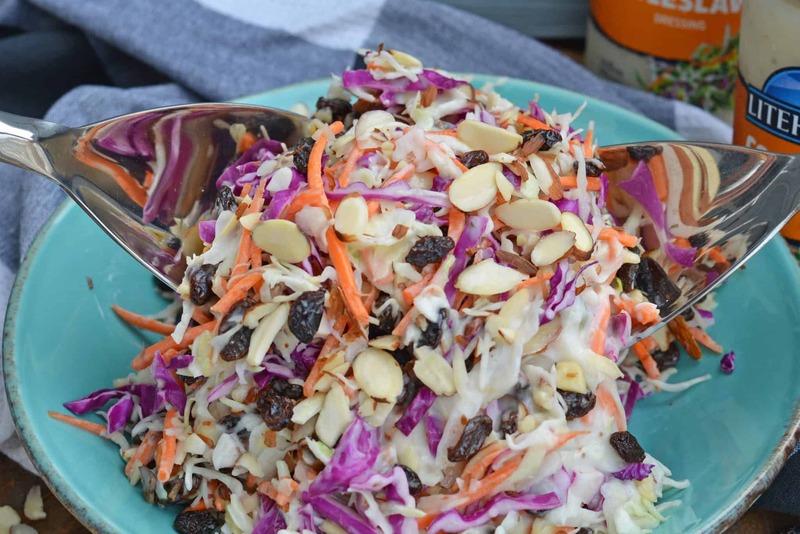 Sweet raisins and crunchy almonds elevate the traditional coleslaw recipe. Other additions can include dried cranberries or cherries, thinly sliced bell pepper, corn or even spices like cayenne, cardamom or tarragon. Poppy seeds are also a popular favorite. FOUR. Coleslaw is best served chilled, so if you are making ahead, refrigerate until ready to plate. If serving at a party or BBQ, set the bowl of coleslaw inside a larger bowl filled with ice cubes to maintain the integrity of your slaw. Combine all ingredients in a large mixing bowl and toss until just combined. Cover until ready to serve. Serve chilled. If you can’t find a bag of pre-cut cabbage with both green and red and carrots, visit your grocers salad bar. They commonly had shredded red cabbage and carrots that you can buy and toss with your bagged cabbage. One 14 ounce bag of cabbage equals one large head of fresh cabbage, if you prefer to shred it yourself. 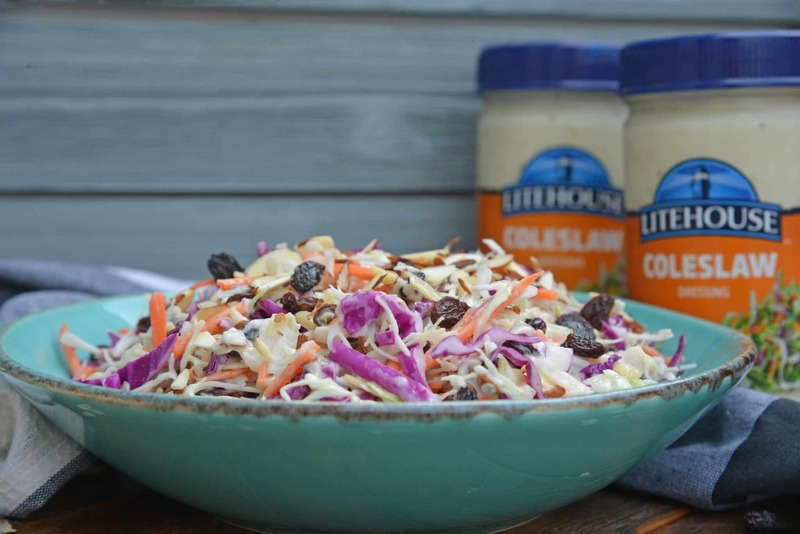 For more information about Litehouse products and Litehouse Coleslaw Dressing, visit www.litehousefoods.com. Ok…my traditional coleslaw is now super boring! 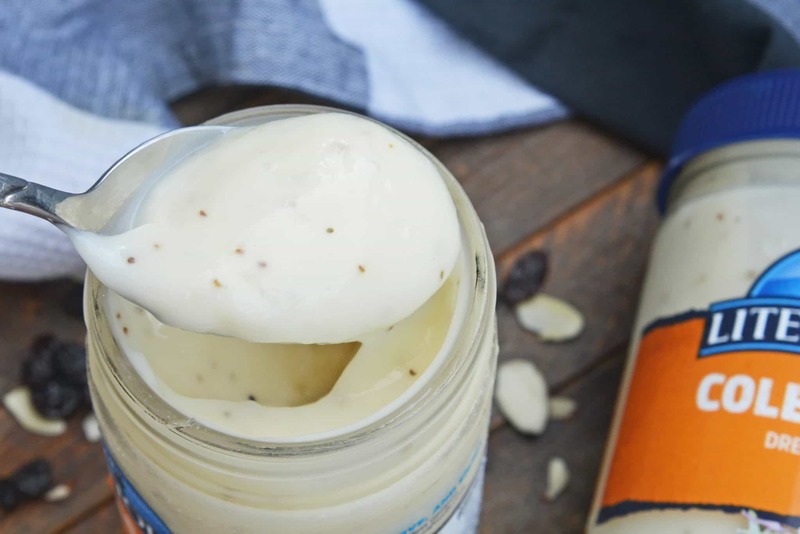 Definitely trying this version NEXT time – i love the addition of the almonds and raisins! 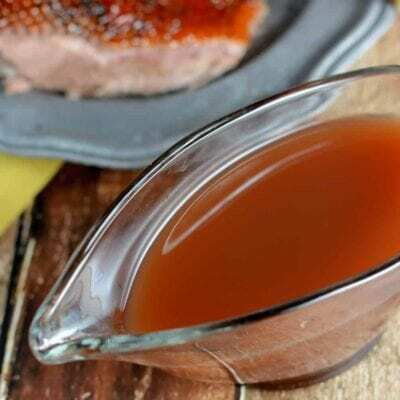 LItehouse dressing is my go-to when I don’t feel like making my own dressing. This has always been my favorite coleslaw dressing and I always by it premade. 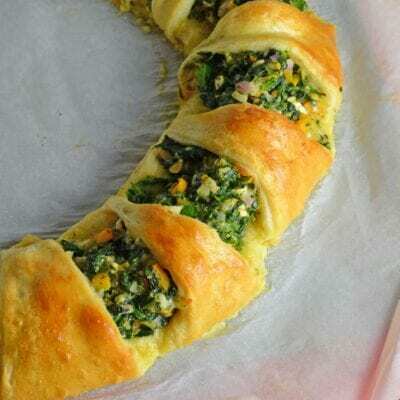 This is the perfect dish for a holiday cookout! I always make my coleslaw with just the slaw but love the idea of adding almonds and raisins to sweeten it up and to add crunch. Oh, gosh I love coleslaw! 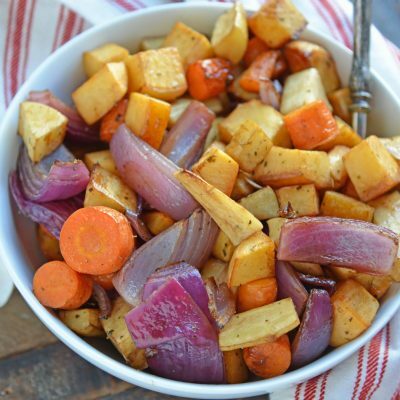 This one looks fantastic, love the addition of crunchy almonds! I love homemade coleslaw! 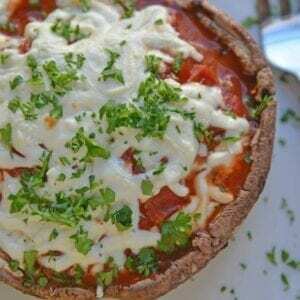 I usually just eat it as a side dish, but I’d love to try it on a sandwich or over nachos, as you suggested. 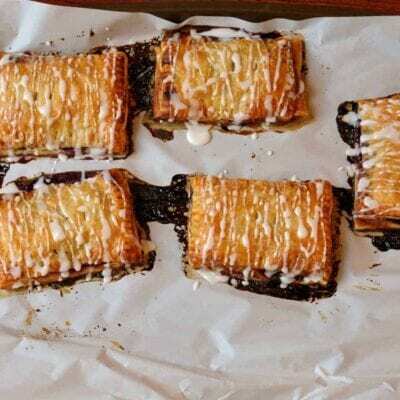 the almonds and raisins are great add-ins!